Interior & Exterior Painting,Cabinet Refinishing, Sheetrock Repair, Power Washing and more! Insured and Bonded. References available. Larry Crosswhite--Owner. No job too large or too small. Free estimates. Call 225-993-1134 today. Beautifying America one home at a time. I love what I do, and it truly shows in my work. 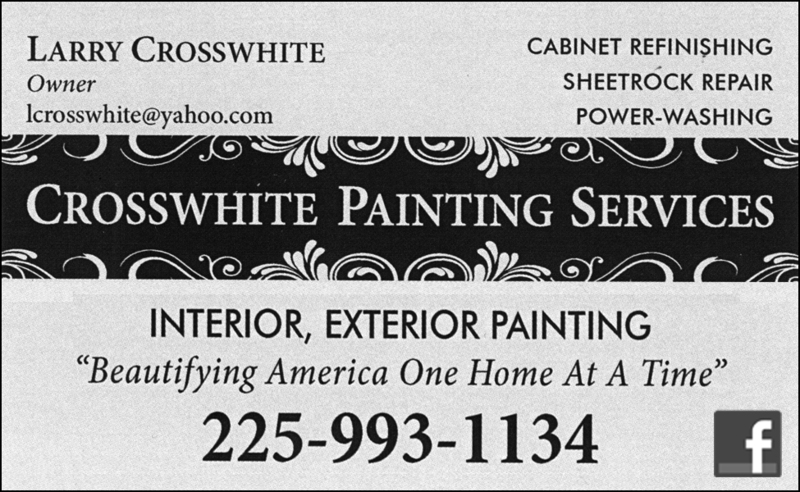 Interior & Exterior Painting,Cabinet Refinishing, Sheetrock Repair, Power Washing and more! Insured and Bonded. References available. Crosswhite Painting Services delivers professional, reliable and on-time services at affordable pricing. We specialize in residential painting and re-painting. With more than 20 years experience, we always try to make the painting process as smooth as possible. We offer a professional, neat and clean service and take great pride in our work, paying close attention to details both large and small. We get the job done right... the first time. We use only quality paints and materials on your home to insure that your home looks great and has the best protection from the elements. A good clean paint job and your satisfaction is always our number one priority. We look forward to the opportunity to serve you with all your painting requirements.